Yes, I’m talking to you, Joe Blanton. I was kind of hoping that in your second start of the season, against the Nationals, you might bounce back a bit from that less than stellar game against the Mets last week. Instead, you gave up 5 earned runs in 6 innings, and after two starts, your ERA is an unattractive 10.45. Yes, I know it’s still early in the season, so there’s plenty of time to turn it around. I suggest you start rectifying this situation during your next start, on Sunday afternoon. In what is becoming a curious trend, the Phillies dropped the first game of their series against Washington, and then came back to win the next two. 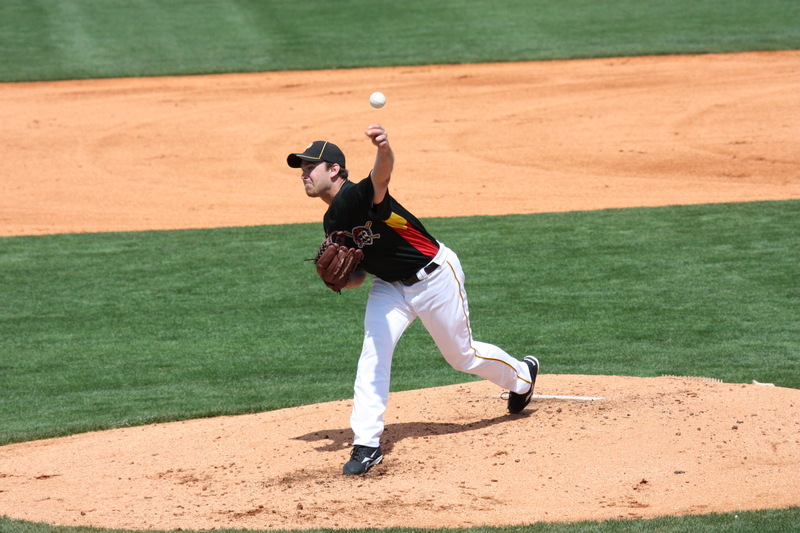 This time, it was Joe Blanton who was not sharp in game one (see above). Additionally, he gave up a home run to ex-Phillie Jayson Werth, resulting in my breakfast the next morning being disturbed by the sight of Werth on the front page of the newspaper. Echh. Roy Halladay took the mound for game two, and had the Nationals shut out through eight innings (yay!). He flirted with disaster in the ninth, giving up two runs, but managed to escape intact for the complete game victory, as the Phils prevailed 3-2. 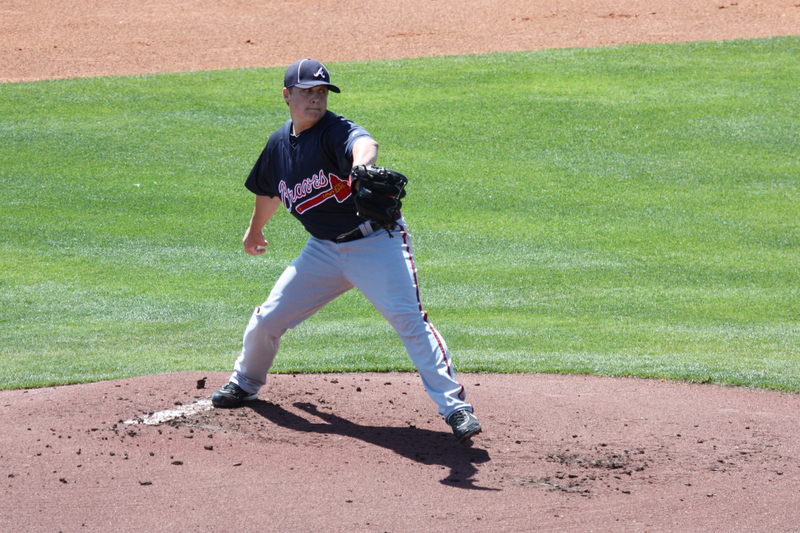 Also in this game, Washington starter John Lannan faced Ryan Howard with the bases loaded in the top of the fifth, and proceeded to hit Howard on the wrist, driving in a run. 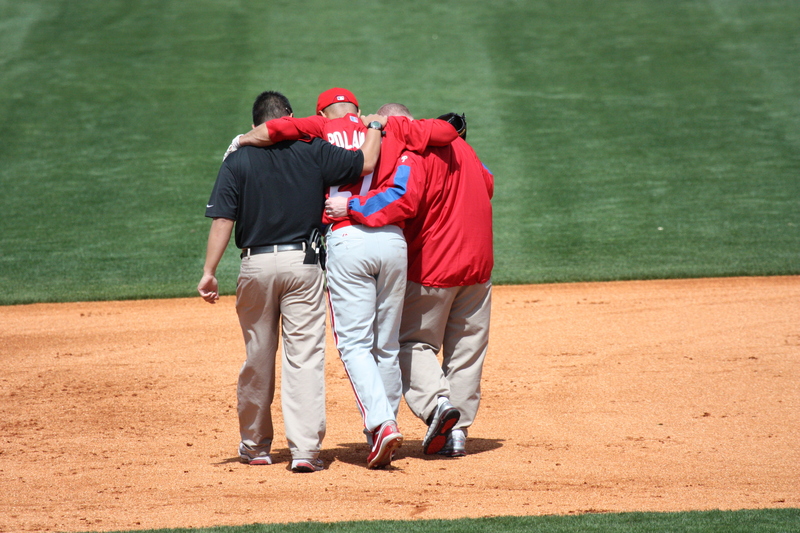 Lannan, if you recall, was the pitcher who hit Chase Utley a few years ago, giving him a broken hand. Yo, John Lannan, stop hitting my Phillies! 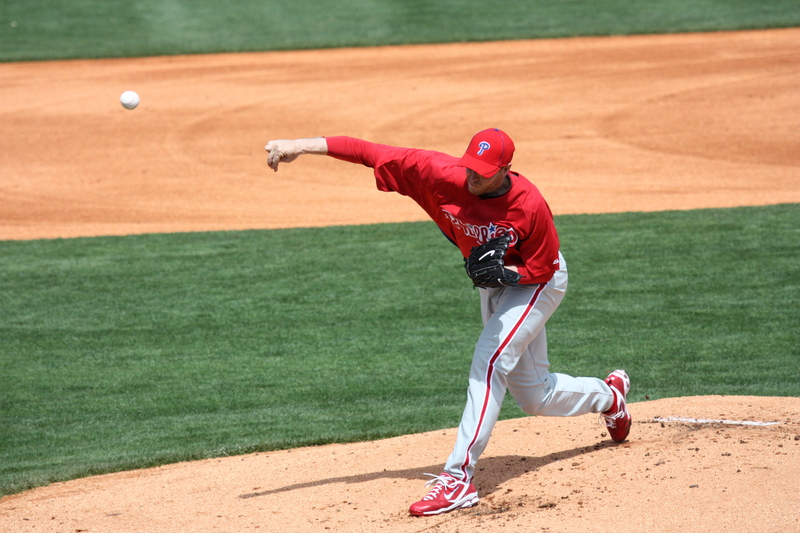 Not to be outdone, Cliff Lee finished off a complete game of his own the next night, as the Phils won 4-0. 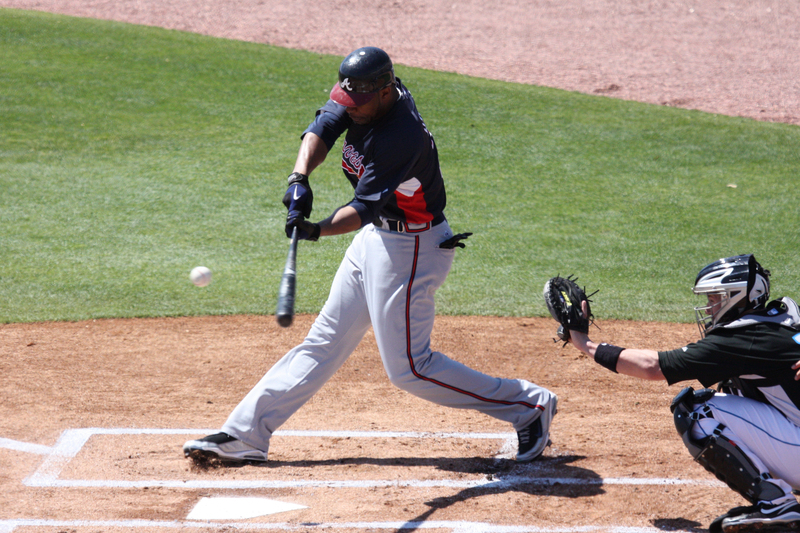 I often find myself wondering about some of the photos MLB chooses to use in the slideshows for each game. For example, why use this one? Gesturing about what? Trying to cue the musical accompaniment for a dramatic ninth inning rally? The size of the proverbial “one that got away”? Or maybe the size of his wallet now that the Nationals have grossly overpaid for his services? I’m sure you readers can come up with something good! Leave a comment if you have an inspired caption to share. There are apparently those women out there who actually find his look attractive, or, as a friend who shall remain nameless put it on Facebook, “dirty hawt”. I personally do not count myself among these women. I think he looks like he just spent 40 days amongst the wolves. 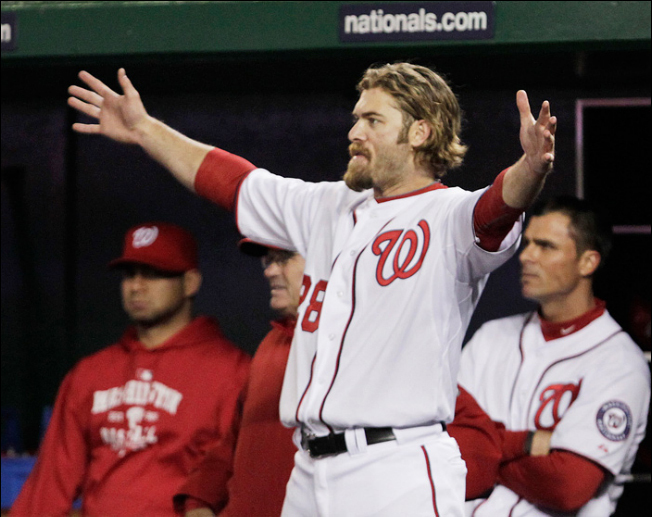 Nonetheless, today comes word that Werth has switched agents, leaving Jeff Borris for the devil himself Scott Boras. 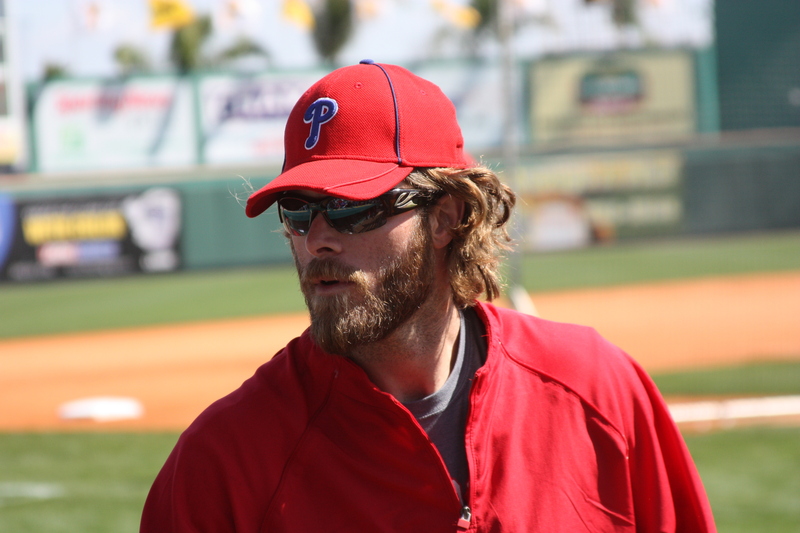 With free agency looming after this season, what tiny hope there may have been that the Phillies would be able to re-sign Werth seems to have just gone from infinitely small to totally non-existent. Raul Ibanez and Shane Victorino are both under contract for 2011, and Werth’s likely replacement, Domonic Brown, is also a Boras client. I can’t see Boras making much of an effort to deal with the Phillies, when he can probably get Werth a big payday elsewhere, and also get Brown a shot at the starting lineup next year. 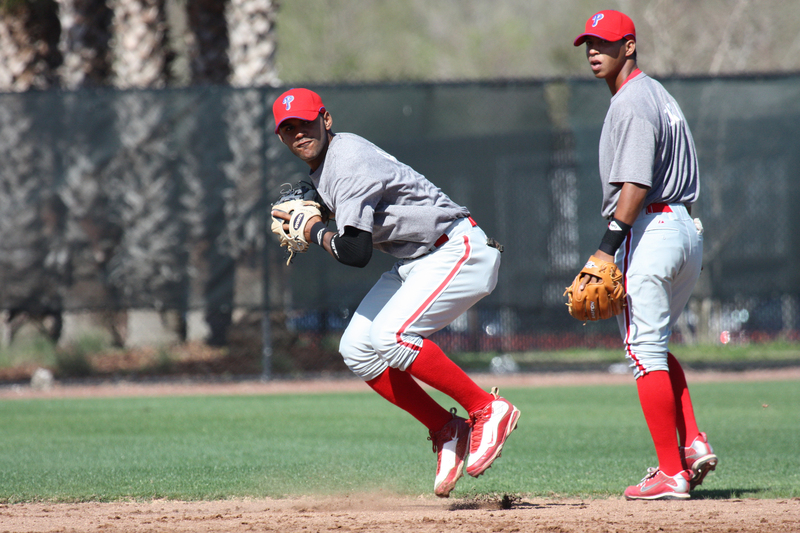 The Phillies had a road game today against the Orioles in Sarasota. 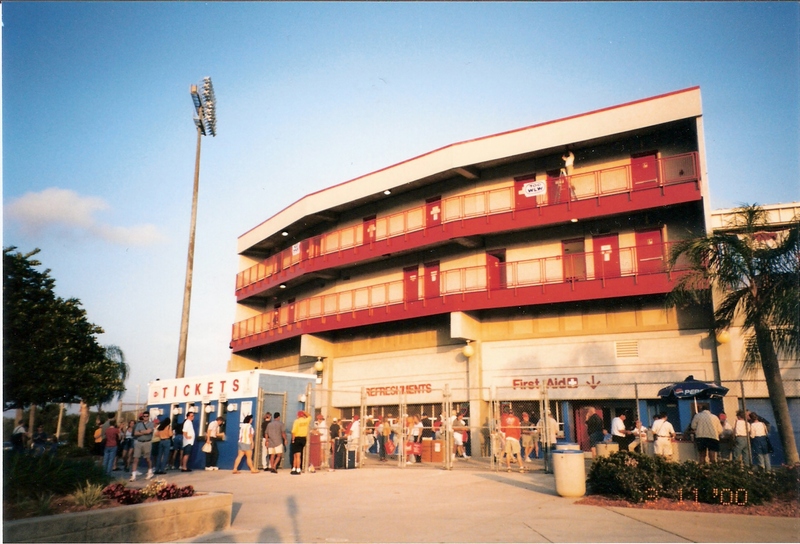 We opted not to make the drive to Ed Smith Stadium, having been there once a number of years ago. It is not a picturesque ballpark. In fact, the exterior somewhat resembles a motel. I’ll have to dig out a photo from those pre-digital days, and scan it in for tomorrow. 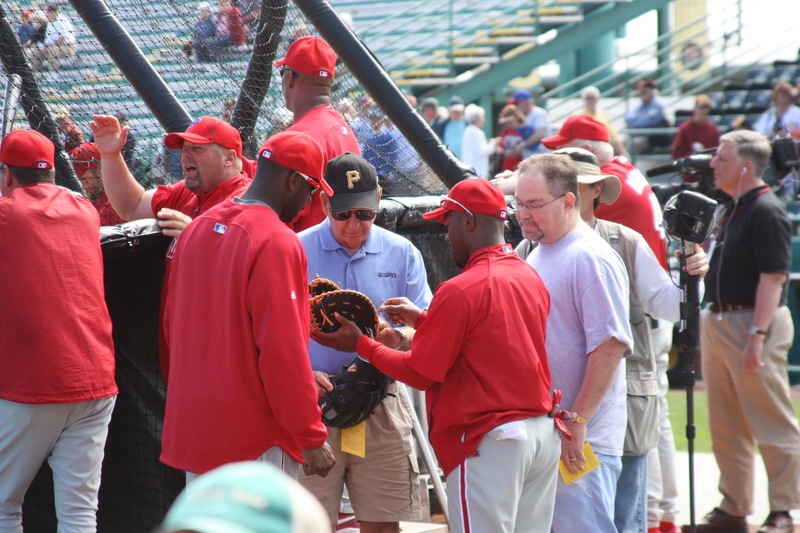 Instead, we decided to take in a Blue Jays – Braves game in Dunedin, with a stop by the Phillies’ Carpenter Complex beforehand to check out some of the minor-league training camp action. 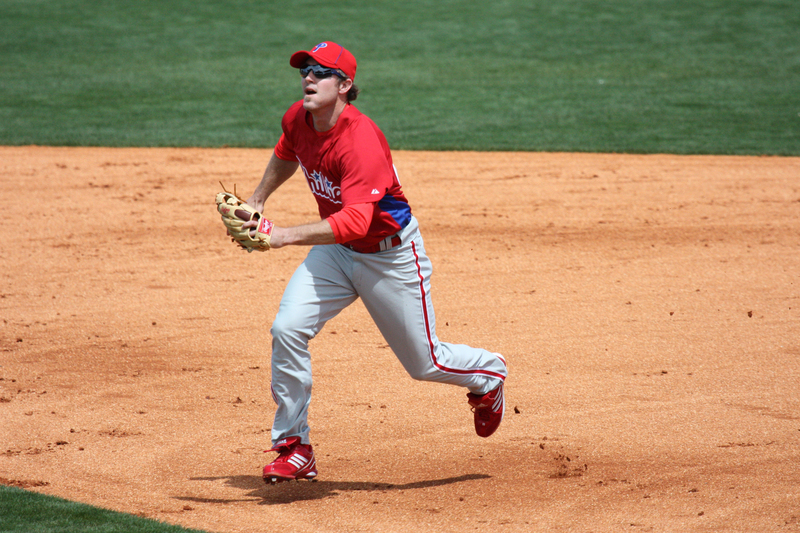 Brandon Duckworth, last with the Phillies in 2003, has returned to the organization on a minor-league contract after stints with Houston and Kansas City. 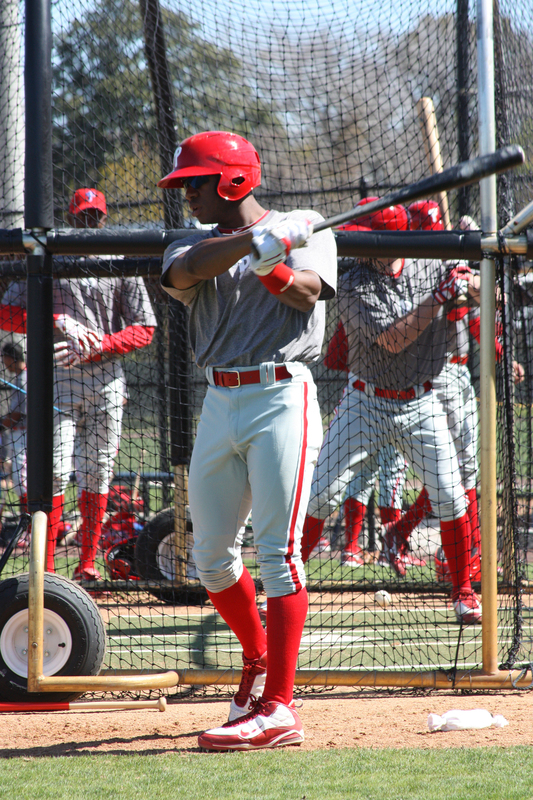 As noted in Larry Shenk’s Phillies Insider blog, and evident in this photo, all the minor-leaguers wear their socks knee-high. No baggy “pajama” pants for these guys! After checking out the workouts for about an hour, we made the approximately 10 minute drive to Dunedin, spring home of the Blue Jays. 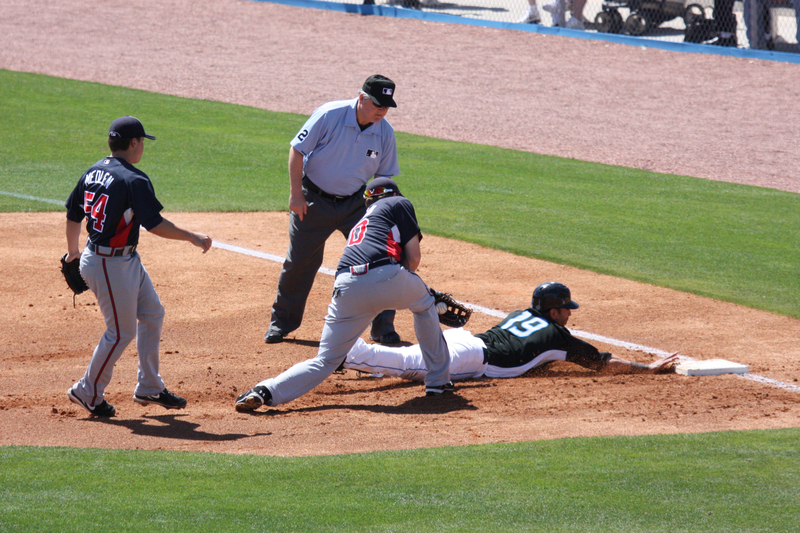 Sometimes going to a game in which I have no rooting interest is a nice break – I can relax and enjoy the game action without getting worked up about the outcome. 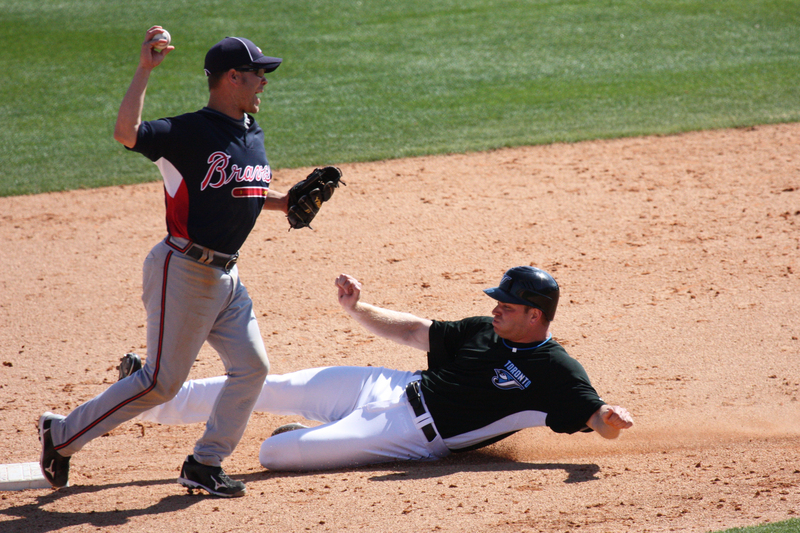 The Jays ended up dropping this game to the Braves, 8-5. After the game we enjoyed a refreshing postgame brew at the Dunedin Brewery, before enjoying Mexican food for dinner at one of our favorite restaurants when we are in Florida, Casa Tina. From St. Petersburg, Bradenton is an easy drive of 40 minutes or so south over the Sunshine Skyway Bridge. The Pirates were hosting the Phillies today, so we made the drive and got there just before the gates opened. I parked myself in a prime spot right by the end of the Phillies dugout near the backstop. My husband is left to wander around the ballpark carrying my extra stuff while I’m clicking away at all the activity on the field. The Pirate Parrot appears to be using a Phillies fan as a footrest. Yo, Parrot, what’s up with that? The Phils came out on top in this game, winning 5-1. Another Phillies victory on another sunny, though windy, day! 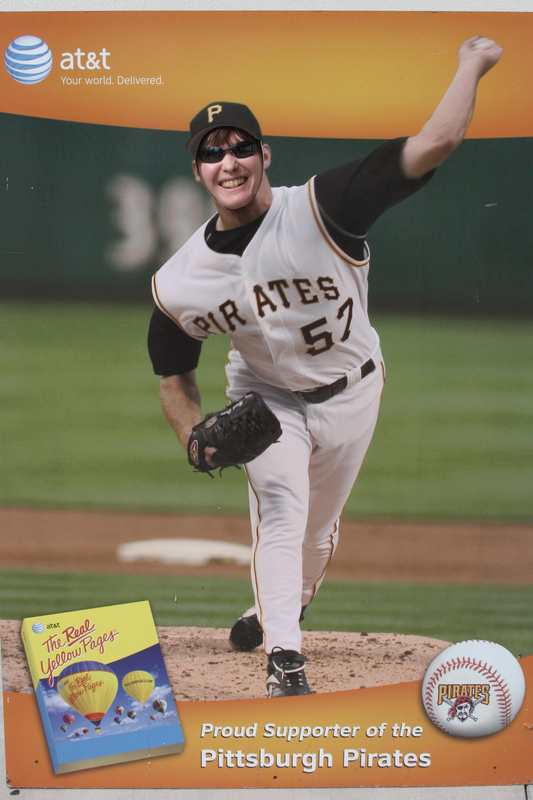 On our way out of McKechnie Field, we stopped for a quick photo op at the large AT&T advertisement with a cutout where Zach Duke’s head would be. How do I look? Afterwards, we took a scenic detour to check out the beaches on Anna Maria Island before heading back to St. Pete. We even stopped to stick our feet into the sparkling Gulf waters, but that water is not very warm in March! That explained why we didn’t see anybody actually swimming. 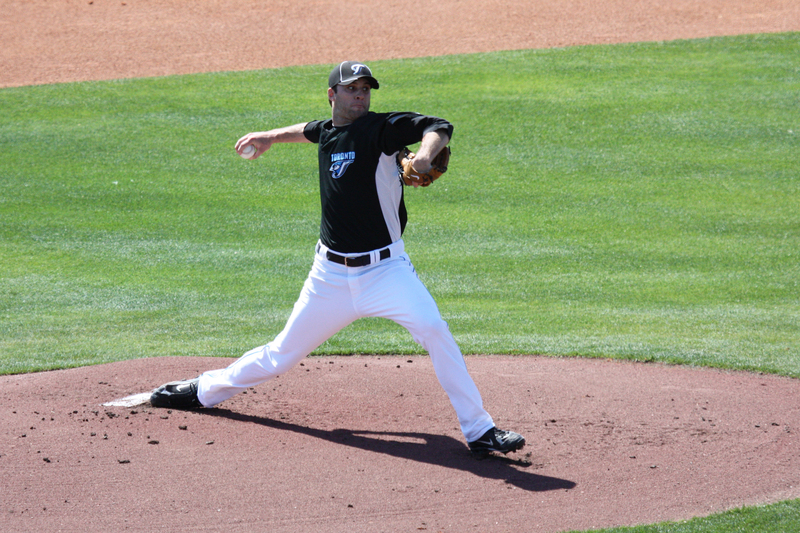 Next up, the third (and final) installment, covering our last two games in Clearwater before we reluctantly had to head home. I’ve finally had a chance to sit down and sort through the many (and I mean MANY) photos that I took during last week’s Florida trip. To make writing about it a less daunting task, I think I will break it apart into at least two, maybe even three, entries. Since I’d neglected to go online and print out our boarding passes until very late the previous night, my husband and I were near the back of the line for boarding our Southwest flight from Philadelphia to Tampa. While waiting to board our plane, we realized that the Philadelphia Union soccer team was on our flight with us. Whereas MLB teams have their own charter flights, MLS teams (at least this one) fly on Southwest. By the time hubby and I got on board, there were no seats left next to each other. So I ended up two rows ahead of him, in the middle seat between two of said soccer players. While soccer players are not exactly behemoths, they are by no means small people. The two I was sandwiched between were both over six feet tall. OK, so this was going to be a bit cozy. As there was a very large storm system apparently covering the entire eastern seaboard, we had the bumpiest flight I’ve ever experienced. I am not a fan of flying, especially during turbulence, and most especially when my husband is not next to me so I can squeeze the bejeesus out of his knee. Our approach to Tampa was particularly rough, and since I decided it would be inappropriate to grab the knees of total strangers, I made do with clutching the back of the seat in front of me. After we’d landed, we found out there had actually been tornado warnings in the Tampa Bay area just prior to our arrival. Yikes! We picked up our rental car and proceeded without incident to our lodging for the week, the Inn at the Bay Bed & Breakfast in St. Petersburg. If you’re ever staying in the Tampa/St. Pete area, I highly recommend it. After checking in, we went for a walk around downtown St. Pete, checking out the empty Al Lang Field, former spring home of the Tampa Bay Rays. It must still be used for something, as the field was nice and green and obviously still being maintained. We made it back to the Inn just in time, as it then started to rain. Later on, we enjoyed an ice cream dinner at Cold Stone Creamery (we’d had a really late lunch and weren’t very hungry). 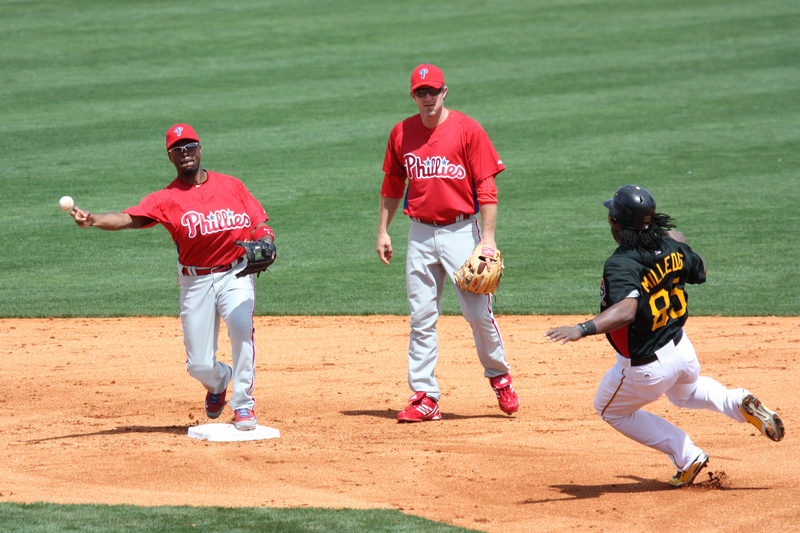 The Phillies had split squad games today, one in Lakeland against the Tigers and one in Port Charlotte against the Rays. We toyed with the idea of driving to Port Charlotte, but the weather forecast was not very promising. Eventually, we decided not to risk driving an hour and a half, paying for parking and tickets, and getting rained out. Good thing, too, as both games did end up getting rained out. In fact, it rained just about the entire day. We opted instead to drive to Bright House Field to do our shopping in the team store on a non-game day, to avoid waiting in the long line that usually forms at games. We also stopped for lunch at the renowned Lenny’s, and left very full. Our first game action! Yay! 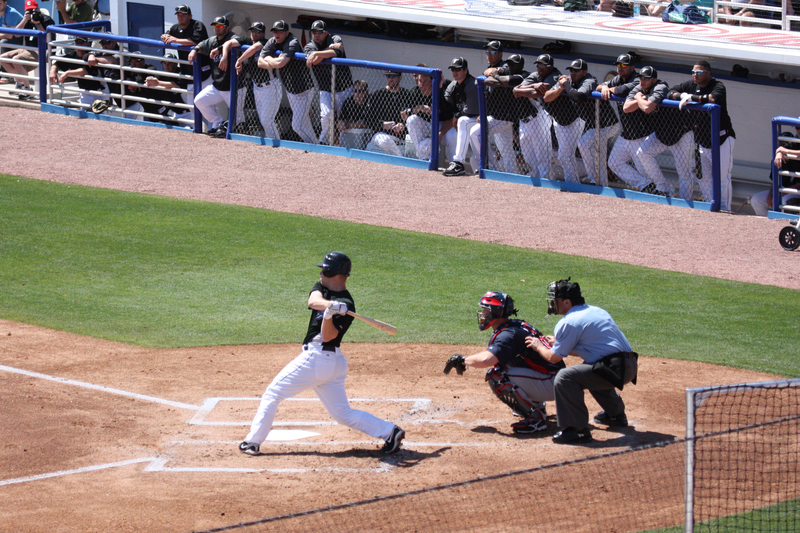 The Phillies were hosting the Twins today at Bright House Field. We arrived nice and early to be there when the gates opened. Here are some of the better pictures from the day. Jose Contreras pitched a shutout inning in relief. How does he stretch his fingers apart like that? That’s it for tonight – Part 2 coming soon! 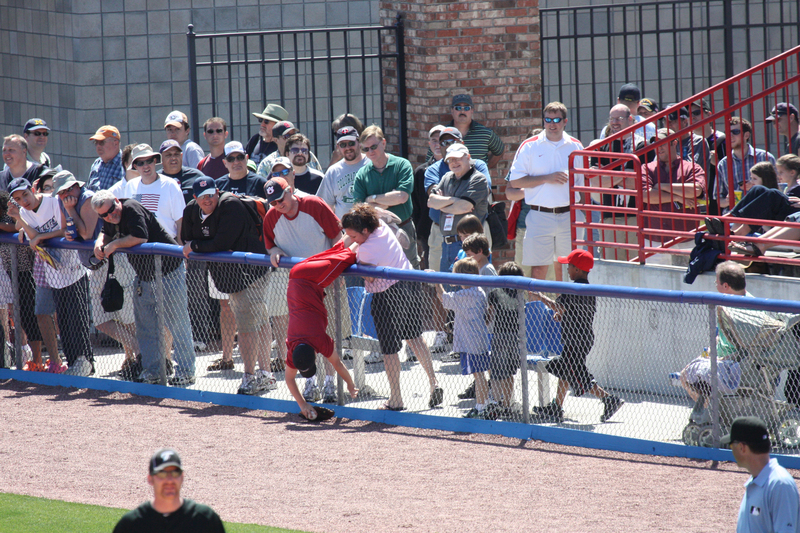 …to keep the Phillies out of the NLCS! After a very stressful pair of games (for me, anyway) against the Rockies at tundra-like Coors Field, the Phillies have a repeat engagement with the Dodgers for the National League Championship. I will admit to missing the end of Game 3. I just could not keep my eyes open, and around 1:30 or so, turned the TV off in the middle of the eighth inning with the score still tied. Sacrilege, I know. My husband was already snoring by this time, and I was not feeling terribly optimistic and did not want to stay up even later if they were going to lose. Then, I dreamed that they had won the game. Imagine my delight to wake up the next morning and find out they really had! Game 4 thankfully came on earlier, so I didn’t have to worry about nodding off. The Phils took a 2-1 lead into the eighth inning, but it looked like things were about to implode after the Rockies scored 3 runs in the bottom of the eighth. I couldn’t bear to watch, so I again turned it off and proceeded to get the kids to bed. 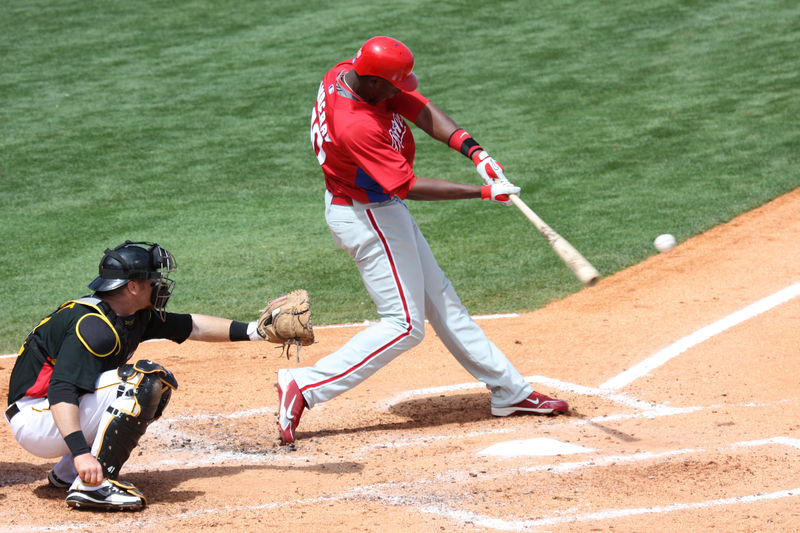 Before settling down (glumly) to watch The Big Bang Theory – which is a really funny show, if you haven’t seen it yet – I had a few extra minutes and decided to check to see if the game was over, and to my shock saw Ryan Howard driving in the tying runs! 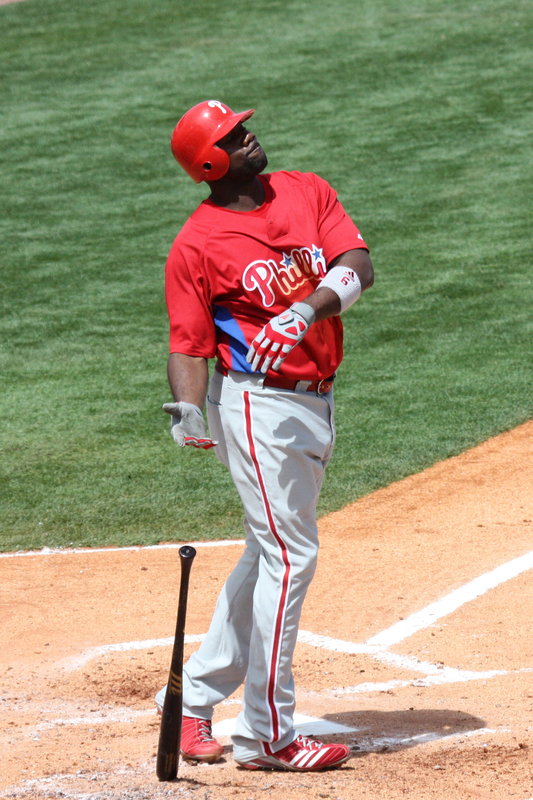 Me (to husband who is coming down the steps): Oh my God, Ryan Howard just hit a two-run double to tie the game! Me: No, I turned it on just in time to see it! So of course we watched the rest of the ninth, saw Jayson Werth drive in the winning run and Brad Lidge get the final out, and went to bed happy that night. After many years of watching the Phillies, I’ve come to the realization that quite a few of their winning rallies coincide with my (or my husband’s) act of turning the TV off. Maybe there is a connection! While it results in our missing a lot of the excitement, I’ll try to stick with that plan for the NLCS. 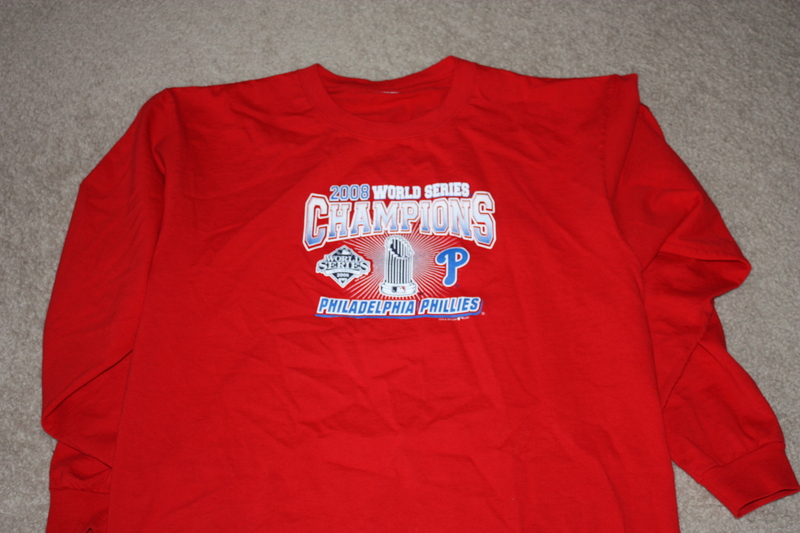 I realized that I was wearing this very shirt during all three Phillies victories (or at least the parts of them I was awake for), but not during the dreadful Cole Hamels debacle of Game 2. Where was it then, you ask? Well, it was (gasp!) in the laundry. I will not make that mistake again! I will only wash it on off days during the NLCS, which by the way, there are too many of, but that will lead me into a whole new rant. Game 1 is tomorrow, so I better get started on that laundry!